Although there�s much to enjoy in Lower Manhattan, one of the unexpected delights is Battery Park City Parks, a 32 acre fringe of greenery with skaters, strollers, and 20 installations of public art. Walk along the Hudson, and pause to watch the sailboats tacking their way up and down the river. Both residents and visitors can enjoy a full program of activities, bird walks, garden tours, performances, classes and more. Experience the sculptures and installations as Battery Park City Parks have become a green canvas for art in public places. The ornate railing outside the Winter Garden announces City of the World by Walt Whitman, for all races are here, all the lands of the earth make contributions here. 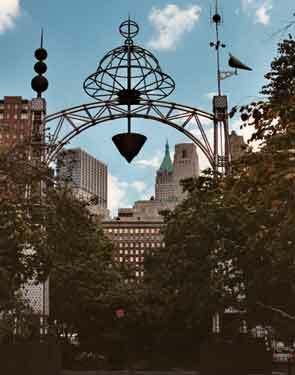 The Rector Gate by R. M. Fischer is an ornate archway at the intersection of Rector Place and the Hudson River Esplanade. Not all the art is whimsical constructions. 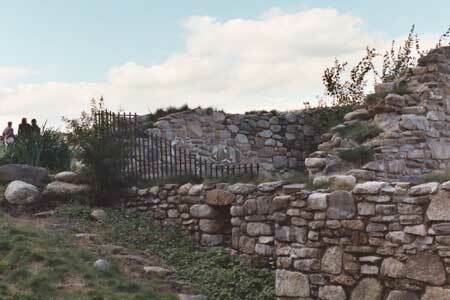 The Irish Hunger Memorial by Brian Tolle honors the memory and experiences of the 1.5 million people who perished in the famine of 1845-1852. It's composed of the reconstructed ruins of an actual cottage from the era. Paths leading up through a landscape meant to evoke the fields. The entrance tunnel is inscribed with snippets from letters and public documents. A narrator and cast tell the story of people's lives. The Winter Garden, originally part of the World Trade Center, is greenhouse of marble, glass and trees. Inside and outside dining, and special shows and exhibits. Just north is a playground for children and adults, broad lawns. And at the northern end of the parks -- an unusual view of the Empire State building, framed by bushes and trees. Battery Park area also contains three different museums. The Skyscraper Museum focuses solely on the past, present and future of these soaring structures. Walk across the street and visit the Museum of Jewish Heritage. This distinctive building of layered concrete focuses on Jewish history and family life as well as current issues. In contrast to the modernism of these two museums is the ornate Beaux Arts U. S. Customs Service building constructed in 1907, located just a few blocks away. It�s now National Museum of the American Indian, part of the Smithsonian museum system. Although everyone knows Central Park, the parks of Battery Park City offer pleasures of a very different kind. It's New York City's other park. Thanks to FreeFind for providing the search technology for this website.